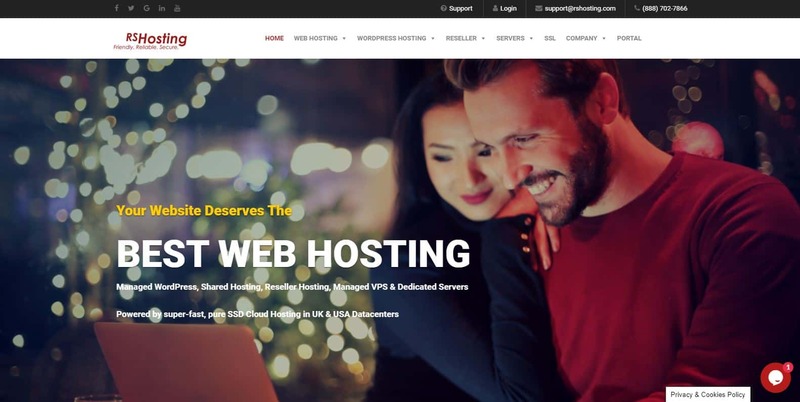 RSHosting Review 2019: Is RSHosting a Good Hosting? RShosting has been in the web hosting business since 2003. With their fully managed dedicated servers located in U.K. and U.S., the vendor is well equipped to offer a variety of hosting solutions including shared hosting, reseller, VPS, and managed dedicated hosting solutions. RSHosting is a web hosting provider established in 2003. The vendor is privately registered and debt free and specializes in providing fully managed hosting services backed by a number of data centers located in the United States and the United Kingdom. They pride themselves on providing secure and reliable hosting solutions operated on SSD cloud servers with RAID 10. In addition, they provide VPS and fully managed dedicated server solutions. RSHosting uses SSD servers for their cloud servers as well as their dedicated and fully managed VPS servers. They allow users to choose the location of the data center that should host their websites. RSHosting offers free offsite data backups with two daily and one weekly file and data restoration points. That said, they insist that the backup services are complementary services therefore encouraging customers to always maintain their own copies of their data backups. Luckily, users don’t have to ask them to download a copy of their website; their control panel enables clients to generate and download website backups. They also offers paid managed backups, which comes with an option to choose your offsite file and data backup retention. RSHosting uses a popular and user-friendly WHM cPanel. In addition, their dedicated servers all come with Plesk or cPanel with a one-click app installer for 400+ apps. They offer free website builders that are fully managed and cloud compatible allowing users to create their own website in just a few minutes. RSHosting web hosting solutions are pretty cheap. Hosting prices are listed in dollars and pounds and clients have the option to pay on a monthly or annual basis. 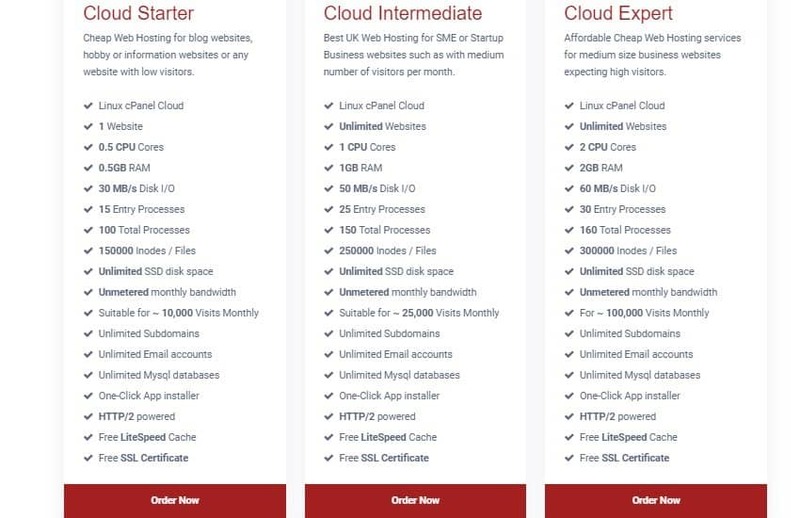 The hosting provider offers an unconditional 30-day money-back guarantee, a 100% SLA for VPS, cloud VPS, and dedicated server hosting, and a 99.9% uptime SLA for managed VPS and cloud VPS. Their compensation plan gives users a refund of 5% to 100% of the monthly service fee for every hour of network downtime recorded on the affected server. RSHosting customer service team is available 24/7. They are polite and helpful when talking to their clients and their response time is extremely quick. Whether it’s by telephone, email, Skype, live chat, or their ticketing system, this team of professionals gives satisfactory support service to their clients. What’s more, their knowledge base includes an array of articles, blogs, and tutorials that offer additional help and answers pertinent to customer questions. They also have an FAQ section and a good number of video tutorials. 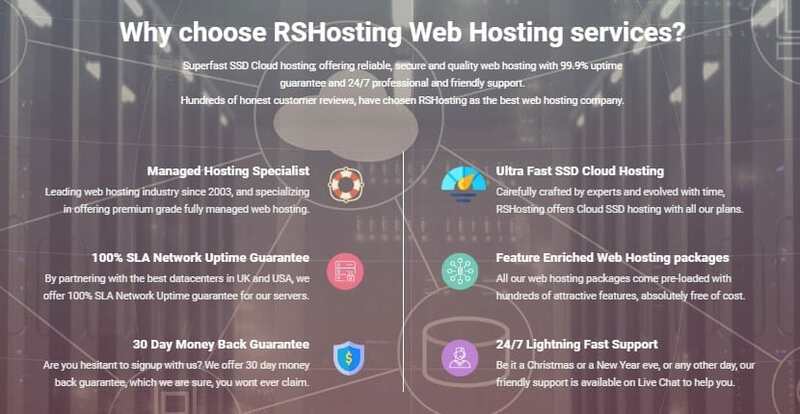 RShosting seems to have invested heavily in the infrastructure and expertise necessary to deliver secure and reliable web hosting services for businesses in the U.S. and the U.K. The wide range of services and features make it a choice hosting provider for all types of businesses, including startups, WordPress websites, and e-commerce websites that receive thousands of visitors every day. Wondering how RSHosting stacks up against other Web Hosting companies? Enter any other Web Hosting company and we will give you a side-by-side comparison.